The De Dannan story is a long and illustrious one. The original band lasted for 28 years, with many changes of line-up, but even so, longer than many other Irish supergroups, Planxty, The Bothy Band. Wikipedia tells the story in outline in a reasonably balanced way. Andy Irvine was briefly a member of the band in 1976 and appeared on The 3rd Irish Folk Festival — his only recording with Dé Danann. Irvine left the band soon thereafter because of scheduling conflicts and proposed Johnny Moynihan as his replacement. Moynihan was a member of Dé Danann in 1976-1978 and appeared on the band’s second album, Selected Jigs Reels and Songs. You can read how Andy Irvine left the band here. Jackie Daly joined the band, on accordion. Jackie appeared on Dé Danann albums through 1985. Dé Danann released The Mist Covered Mountain on the Gael-Linn label, with Seán Ó Conaire & Tom Pháidín Tom on vocals. Maura O’Connell joined the group as vocalist — appearing on Star-Spangled Molly. Maura was in the band 1981-1982. Founding member, Charlie Piggott, left the band sometime after the release Star-Spangled Molly. Mary Black was Dé Danann’s vocalist (approx) 1983-1986. In 1983 Martin O’Connor joined on accordion, and remained with the band until 1987. Most sources say that he replaced Jackie Daly, but both Martin and Jackie appear on the 1985 album, Anthem. 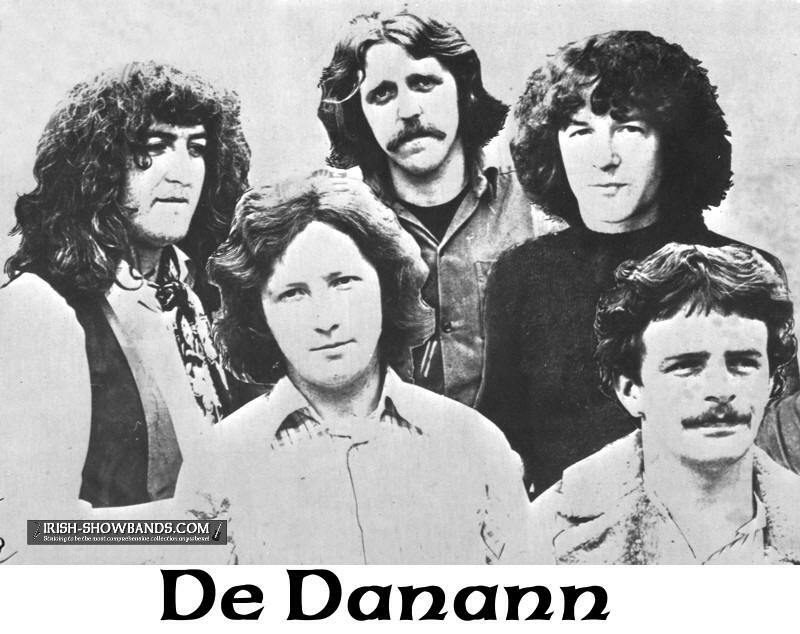 With the release of Anthem, the band changed the spelling from “Dé Danann” to “De Dannan”. Delores Keane returned to the band during this period. Appearing on 1985’s Anthem, along with Mary Black, and as the main vocalist on Ballroom in 1987. Aidan Coffey replaced Martin O’Connor on accordion in 1987, apparently after the band recorded Ballroom. Eleanor Shanley joined the band as vocalist and remains until 1992. Founding member, Johnny “Ringo” McDonagh left the band and was replaced by Colm Murphy on bodhrán — who remained with the group until the initial break up in 2003. Tommy Fleming became the band’s next vocalist, leaving the group in 1997. Derek Hickey joins De Dannan, replacing Aidan Coffey on accordion. 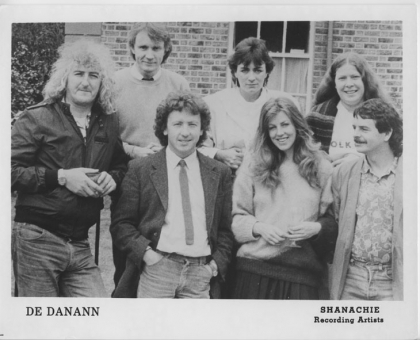 The band members went their separate ways at which point, the name De Dannan (Dé Danann) was copyrighted by Alec Finn. Following the break-up of De Dannan, Frankie Gavin spent six years pursuing a successful solo career and working with a new band: Hibernian Rhapsody. In 2009, Frankie Gavin decided to perform at the World Fleadh at Castlebar with a new line-up using the name Frankie Gavin and De Dannan. Former De Dannan members like Mary Black, Dolores Keane and Mairtin O’ Connor joined Gavin for the one-off show. Promoting his new band as Frankie Gavin and De Dannan led to a dispute with former band member Alec Finn who had registered the name De Dannan when they split in 2003. The dispute was eventually settled after an exchange of solicitors’ letters. Alec Finn reformed “Dé Danann” with founding member, Johnny “Ringo” McDonagh, and past members, Eleanor Shanley and Derek Hickey. This group released the first album, under the Dé Danann (De Dannan) name, in ten years — Wonderwaltz. Frankie Gavin & De Dannan released Jigs, Reels & Rock ‘n’ Roll. 1978 Alec Finn (bouzouki), Frankie Gavin (fiddle, tin whistle) Johnny Moynihan (bouzouki, mandolin), Charlie Piggot (mandolin, banjo, melodeon, Ringo McDonagh (bones, bodhran) – left to right.